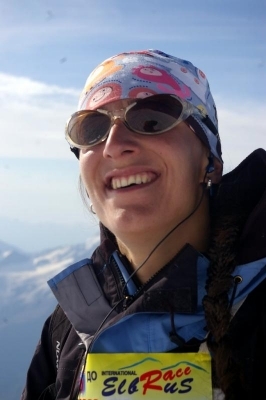 FUND's GOALS ARE: To promote mutual understanding and friendship across cultures through a shared love of mountains and mountaineering. 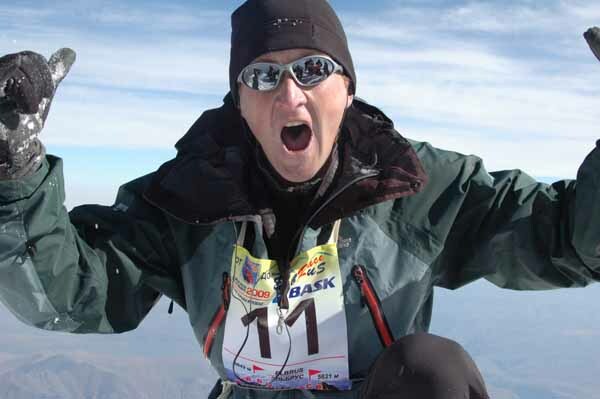 To support the styles of high-altitude training, ascent, and environmental sensitivity that Anatoli exemplified. 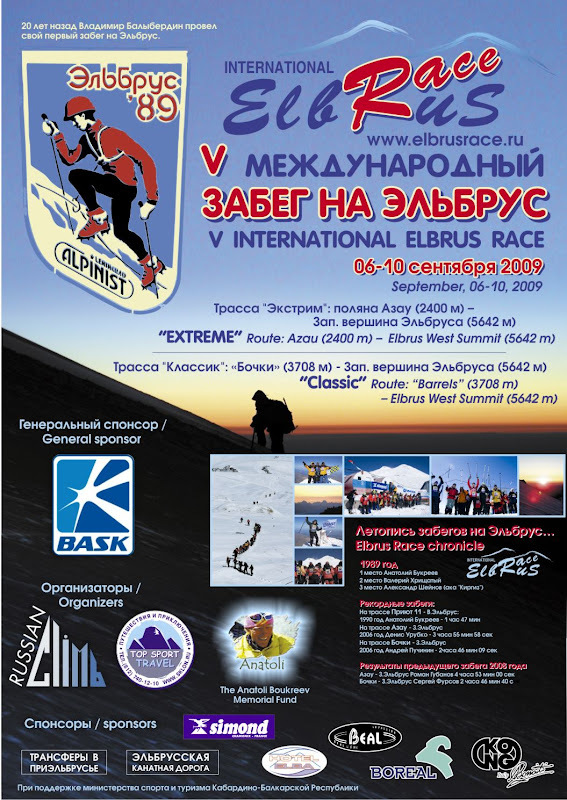 Elbrus accepted the fifth annual International Elbrus Race competitions very graciously: the weather was picturesque in the day of qualification race and in the main race day. The athletes have a real pleasure to race on a good track. 38 people have applied to participate. These were the athlets from Russia, Ukraine, Belorussia, Czech Republic and Italy. 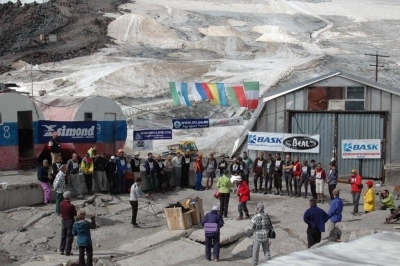 Due to financial and moral support from the company BASK (the general sponsor of the competition) and the support provided by the Anatoly Boukreev Memorial Fund, Elbrus race was not only successfully carried out but showed certain development! 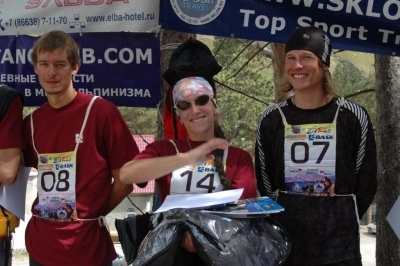 It was noted by all regular participants of Elbrus Race. 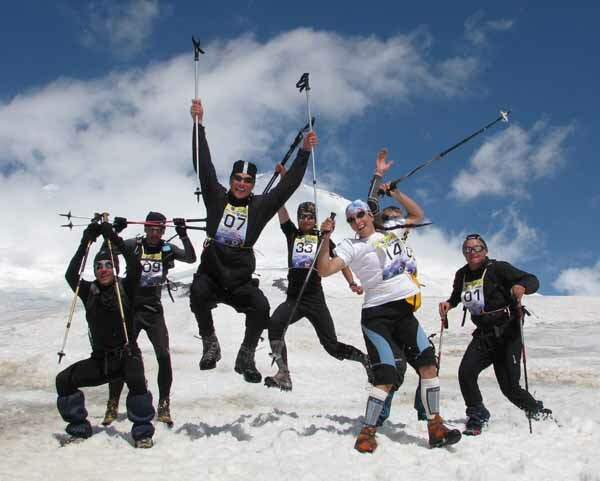 For the fifth year we run the race on Mount Elbrus, and each time the competition differ from each other. Different athletes, mood, a different shape training and the circumstances of the event. 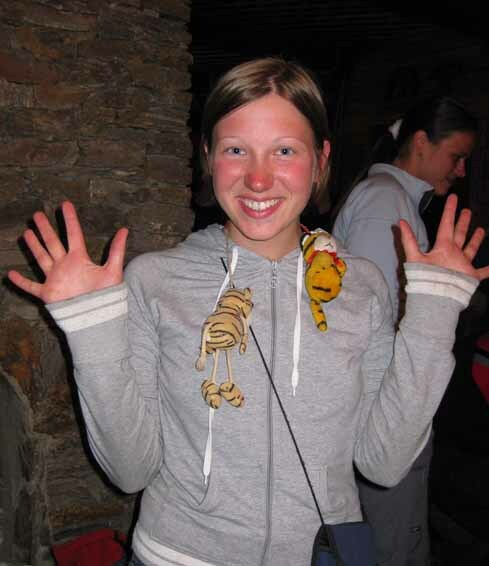 This year, for example, the opening day of competition, it was appeared that the cableway does not work. 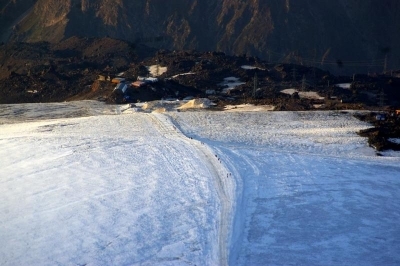 Therefore, during all the competitions it was only possible to go by foot or by car to reach the Barrels (3708 m). On the way to the Caucasus, the organizers got call from one of the main contenders for victory in the "Extreme" Roman Gubanov. He said he would not be able to take part in the race, having problems with his foot. There were also calls from two high-altitude judges too sudden, circumstances did not allow them to come to the competition. Therefore, at the opening, we were a bit worried, but soon realized that to no avail: an application for "Extreme" showed a great list of participants - 9 athletes instead of usual 3-4. Some of them tried to force there, while others who were already familiar with the route, hoped to improve their results. Since judging team, too, everything turned out well. 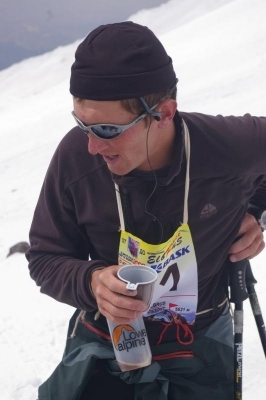 Serguey Fursov participated in the International ELBRUS RACE fot the third time. In 2008 he won the "Classic", and now he became a winner in the "Extreme" with a magnificent result 4 hrs19 min. Six athletes in "Extreme" class had results times less than 5 hrs. Of course, the record of Dennis Urubko is yet unattainable, but the density of the results, which the guys showed today, suggesting that the time of running of "Extreme" route will be decline in the future. For example, Andrew Mariev, who took second place (4 hrs and 30 min), improved his result from last year at 1 hour 17 minutes! And Vladimir Kuznetsov - on 37 minutes! 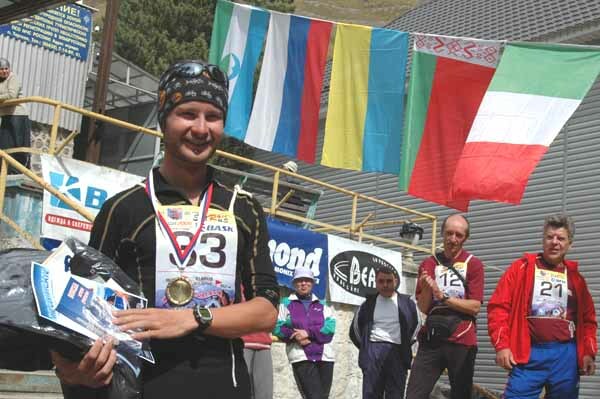 Alexander Sidorenko reach the top a little behind Mariev, and he he became the third medal in the class of "Extreme". 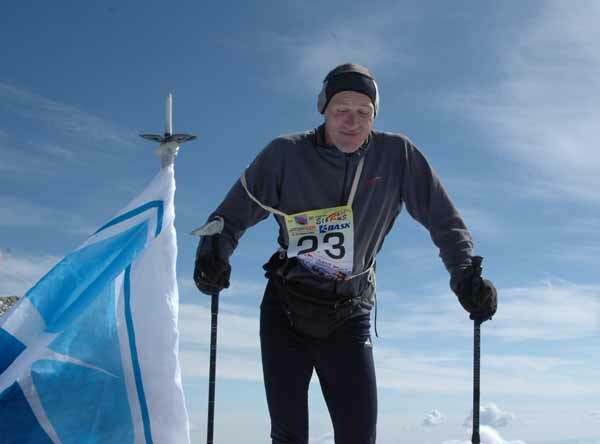 But Alexander took part in Elbrus speed climb in Baldyberdin race 1990! The vast experience allows him now to compete with younger athletes now. But the application to the class of "Classic" showed that the International ELBRUS RACE becoming popular among young people. 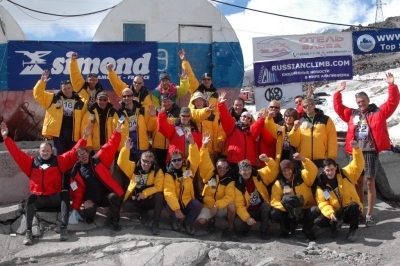 And if the previous records on the "Classic" belonged to an experienced Asian high-altitude climbers Andrew Puchinin, Semjon Dvornichenko, now frisky young guys from Omsk and Rostov-Don showed that they afford to press Elbrus champions. Valentin Vergilyush (Rostov-Don), 23 y.o. set a new record on the "Classic" route "Barrels - West top" - 2 hours 36 minutes. And the judges on the top had noted that he had obviously more reserve forces. Anton Proshchenko from Omsk was the route for 2 h 43 min. 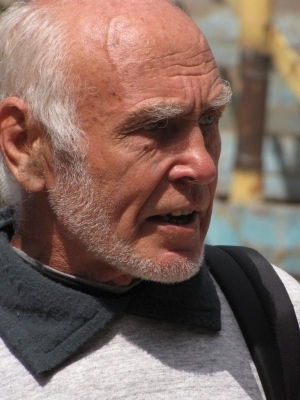 Mikhail Klimov (Moscow) for 2 h 45 min. The Ministry of Sports and Tourism of the Republic of Kabardino-Balkaria had greatly supported our competitions. The head of Tourism Department Mahti Otarov welcomed athletes at the open and the awarding ceremony. Beautiful Caucasian prizes (artfully decorated daggers) were awarded to the winners of all nominations, and also (it was so unexpected and pleasant! ), to organizers of the competition Shustrov Nikolai and Elena Laletina, Chief Judge Vladimir Shopin and the head of BASK company (the general sponsor of the event) Vladimir Bogdanov. I want to commend separately the excellent judging panel. 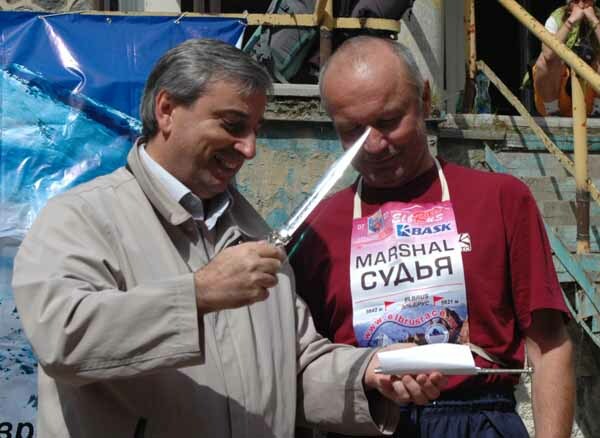 The Chief judge of the competition Honoured Master of sports in mountaineering Vladimir Shopin has extensive experience not only as a strong athlete and coach in the past (he was a member of the first and the second Soviet Himalaya Expeditions - to Everest (1982) and Kangchenjunga (1989), but also as a judge, and even was the judge on balyberdin's Elbrus competition in 1990. Responsibility for the athletes, fast competent decision-making, clarity and finesse - that's Vladimir's leadership style. All this combined with his real great prestige did it possible to organize the competition on a good level. An event was broadcast on the official site www.elbrusrace.ru, in the News ITAR TASS, www.gazeta.ru. TV channel Vesti (Nalchik), and TV "1 channel" gave a report from an altitude of 3700 m (despite the dead cableway).